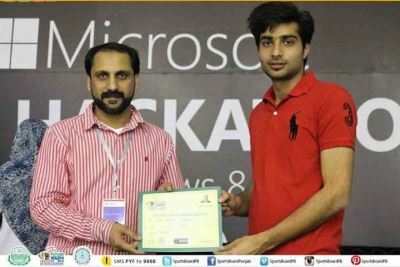 Student and Microsoft Student Partner (MSP) Ahmed Khateeb, CS 5th semester (SP12 Batch) from Comsats Islamabad secured 2nd position in Microsoft's Hackathon 2014 for Windows Store Apps 8.1 held Under Punjab Youth Festival 2014 at Qaddafi Staduim Lahore. (Business Manager at Microsoft Innovation Center Lahore). More than 86 teams (4 members each team) participated in this event from 25 different universities including LUMS, NUST, FAST and many top universities from Karachi, Lahore and Islamabad. Ahmed Khateeb was the part of team named Spark developed around 800 apps for this Hackathon along his team (from LCWU) out of which 350 apps are running on Windows 8.1 Store. Result was announced on 5th May, 2014 on Microsoft Innovation Center Lahore's Official Facebook Page. © CS CUI 2018. All right reserved.